Riverdale is a popular television series that has many different characters, good bad and neutral. 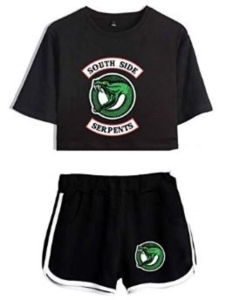 This is a fun crop top and short set that is based after the Southside Serpents. On the front of the crop top you will find the text of Southside Serpents with a green snake which makes up the logo. On the shorts you find the same Southside Serpents logo as well as some white pin stripe design on the side of the shorts. Available in a wide variety of women’s sizes that will range from XSmall to 2XL and you can choose from many different mix and match tops and short colors. Do you want to catch Pikachu? 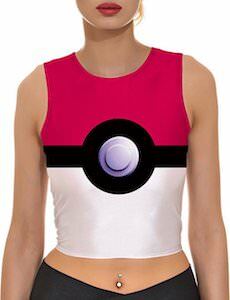 If you do maybe it goes easier if you are wearing this Poke Ball crop top. The women’s short tank top looks just like a Poke Ball with red and white and the black bar in the middle. The Pokemon design covers both the front and back and that means that you can be Poke Ball or it can look like you are inside the Poke Ball. You can get this special Poke Ball crop top in women’s sizes Small – XL and it is made from 88% polyester and 12% spandex and that means that you can make it form fitting if you like that or wear it looser if you size up. Summer is here and that is the time to wear this Pikachu crop top. 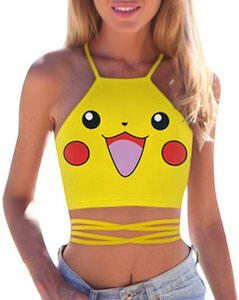 The yellow top shows the face of the Pokemon star and besides that there are lots of laces going from the front to the back and spaghetti straps on for the shoulders. Show the world you love for Pikachu! Because of the laced up back you can easily adjust the tension so that it fits you perfectly. This Pokemon top will get your sun exposure and that helps with that summer tan. Made from polyester and spandex this top will fit you like you want. If you are a Alice In Wonderland fan that would like a fun and short top for summer then you are in luck. This women’s crop top is short and will show off you belly button and it has spaghetti straps to and fun laces on the back so now you are ready for summer and will get a wicked sun tan. On the black front of the top you can see some smiling teeth that of course you know are from the Cheshire Cat and above the teeth it says “We’re All Mad Here” just like the cat said in the famous story. If you really like short tops for summer and Pikachu then this crop top is just what you need. The crop top is yellow and sleeveless and on the front you can find the face of Pikachu the big Pokemon star we all love. Made in one size to fit many this crop to will stretch and will fit women’s US size 6 – 12 and will even stretch to a size 14. Now you will get noticed because you are wearing a fun top that has the most adorable Pokemon character Pikachu on it and that of course will make people smile.